Welcome to the launch of our new website and new look! We know we’ve been quiet for the past year while we worked on a number of new updates, and we’re thrilled to be sharing our progress with you! people are using the DosaMaker for a lot more than just making traditional Indian dosas! While using the Dosamaker for the commonly known traditional Indian dosa is still very popular, our customers are also making a variety of other types of dosas and using them like a wrap or crepe. And as we hoped, people are trying their own unique batter recipes, and eating them for breakfast, lunch, dinner, and dessert with a variety of fillings. We also learned that people who weren’t familiar with the versatility of a dosa believed that the DosaMaker was only used to make traditional Indian food, since our brand was “Soul of India Cooking Co.” They do not make Indian food at home (some had never even had it before) and didn’t think the DosaMaker was a product they would use. But after enjoying a variety of dosas (especially our non-traditional recipes) during our demos, they realized how delicious dosas are and how they can use them in a variety of ways with the foods they already enjoyed. It was clear that our brand name was limiting, and needed to evolve to help customers appreciate the versatility of our appliance. So we’re proud to announce that moving forward, “Soul of India Cooking Co.” will now be “DosaMaker”. 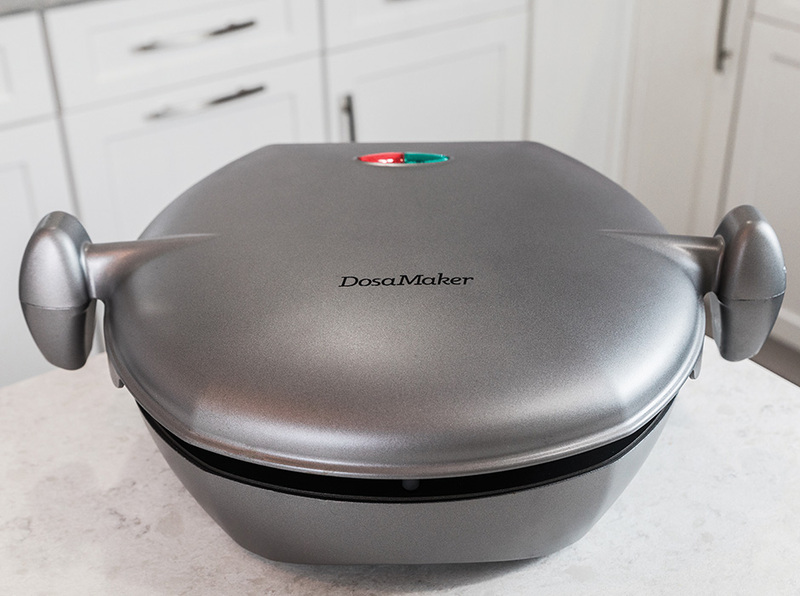 The name “DosaMaker” pays homage to the thin, crispy traditional Indian dish we love, while including the new non-traditional dosas you can make on the appliance and enjoy with any type of cuisine. And it reflects our core value that dosas are for everyone, not just those who enjoy Indian food! Be sure to check these out and stayed tuned as we’ll be add more on a regular basis and posting recipe videos soon! We’re thrilled to launch our new site and please stayed tuned as we’ll be updating this blog regularly and posting new content on Facebook, Instagram, and Twitter. From recipe videos and pics from events, to details on how customers are using their DosaMaker to eat healthier and feel better, we’re here to help you get the most out of your DosaMaker! Don’t forget to sign-up for our mailing list at the bottom of this page, and if you have any questions or feedback please email us at hello@DosaMaker.com.